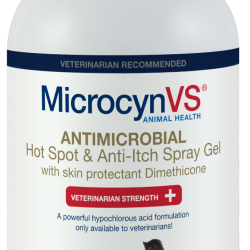 MicrocynVS® products will change the way veterinary clinics address and treat hot spots, wounds and other animal skin ailments. These products have at their foundation a proprietary and highly shelf-stable hypochlorous acid solution called Microcyn® Technology, which is used in the cleaning, irrigation and debridement of wounds, burns, cuts, rashes, biofilms and abrasions as well as the irrigation and cleansing of eyes (with intact cornea) and outer ears. At the same time, it is non-toxic, non-irritating and non-sensitizing. This technology has successfully treated over ten million patients (both human and animal) over the past decade. Each of the MicrocynVS® products contain 190PPM Hypochlorous Acid (OTC products contain 140PPM), making them some of the most powerful hypochlorous acid formulations on the market. 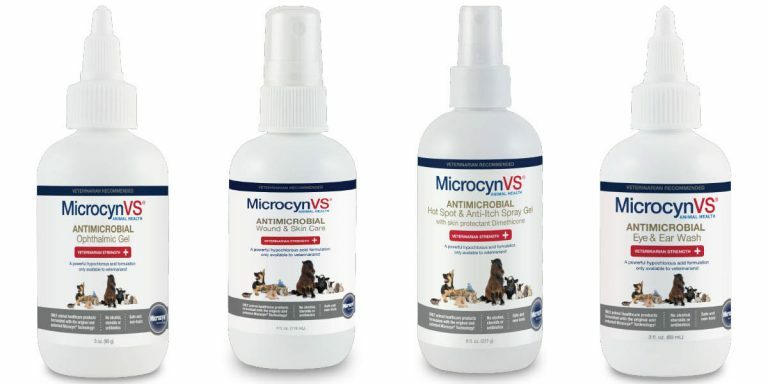 The vet-strength MicrocynVS® products were just released in February 2018. This entry was posted in MicrocynVS, Products and tagged Animal Dermatology, animal meds, animal skin treatment, animals, cat medication, dog allergies, dog ear infections, dog medication, hot spots, medications, online pet meds, pet allergies, pet medications, pharmaceutical compounding, veterinary compounding, veterinary medicine. Bookmark the permalink.